As an urban planner, the first thing I noticed was the cycling infrastructure, and the people using it. It was on a scale I’d never seen before. A friend who went to Amsterdam earlier this year complained that, actually, there were so many bikes that people on feet suffered – and I’m inclined to agree. It was not a walker’s paradise. The space reserved for cycles was unlike anything I’d ever seen. There were cycle parking spaces everywhere, but there were still bikes attached to bridges, trees, and every other stationery object you can think of. There were special bike lights incorporated into the stoplights, so that cyclists got a head start at intersections, and had special buttons for tripping the lights. At roundabouts, cyclists were protected from cars with divided lanes and special entry/exit routes. In addition to the gazillion bike racks we saw, many houses with one or two steps had a small track (see picture above) to wheel cycles into and out of the house. Every road had a bike lane, and many of them were segregated from the street and the sidewalk, even a few miles from the city centre. Although the infrastructure was impressive, the attitude was clearly the biggest difference: everyone cycled. I saw old people, children, young mothers with children. Many houses had four or five bikes outside. Furthermore, I could count the number of road bikes I saw on one hand. People rode clunky cruisers or cargo bikes, and most people pedaled along at a pretty stately pace. And of course the sheer numbers of cyclists meant that drivers were always on their guard. 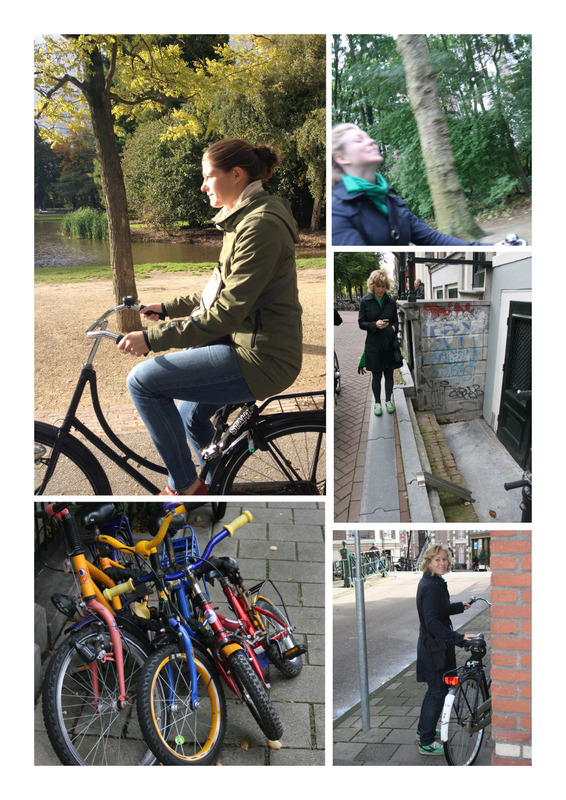 With so much to love about cycling in Amsterdam, I was surprised, therefore, when Karin and I finally rented bikes and I didn’t totally love cycling in Amsterdam. For starters: there was traffic. All those people cycling…it was stressful. If anything, I spent most of the time in the downtown area feeling like I could use a little more space. There was also a weird thing where motorbikes were allowed in bike lanes. The lanes were wide enough to accommodate two cyclists (for passing), but they didn’t have clearly demarcated lanes, and it was easy to slip into the middle of the path (this is probably something that stupid tourists do that drives locals nuts). But anyway, you’d be pedaling along at a reasonably brisk pace, and all of a sudden there would be a motorbike on your bum. I’m not trying to be cranky, but if you are sitting on something that can go 70 miles an hour, you should not be in a bike lane. Karin and I toodled around the city for a while on our bikes, cycling to the Het Schip Museum (where we harassed our poor tour guide for information about development projects in Amsterdam until he managed to escape) and then heading out to the newer parts of the city. I’d insisted we go to the city museum, which had cool infographics about the expansion of the city, but the history of the city was pretty obvious from the urban design – and the Amsterdam School is my new favourite architectural movement. The neighbourhood we started in was 19th century, but we moved pretty quickly to late 19th/early 20th century, and then into a 1920s neighbourhood that went on for miles. We had nurtured the idea that we would rent bikes and ride out among the windmills, but in the end we ran out of time, so we’ll have to save it for another trip. This is a post from my other blog, Snacks and Adventure, about my experience as a cyclist in Amsterdam. Enjoy! I want to see a picture of these roundabouts with divided lanes and special entry/exit routes for bicycles. As for the motorycles in the bike lanes, how do other European cities reconcile the advent of dedicated bicycle lanes with the traditional practice (legal everywhere other than the USA, to my knowledge) that motorcycles can pass slow/stopped traffic on the shoulder?